Just like every season, Lakme Fashion Week this year too presented the best of style and entertainment. From the super talented line-up of designers to the top notch celebrities, it had the best of glamour to offer. And now it is safe to say that we have achieved the sartorial contentment that we need to see us through the upcoming summer festivities. While the designers did a fab job with their creations, the celebrities too left no stone unturned to spill the sass on this coveted runway. 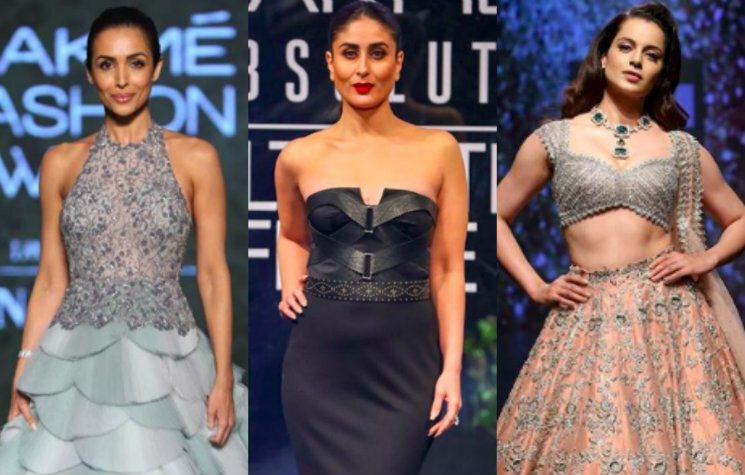 Here's taking a look at all the Bollywood showstoppers who brought their A-game to the most loved fashion week of India. Doing the final act, Kareena Kapoor Khan's finale act for Shantanu And Nikhil was breathtaking. Her long black gown topped-off with a bold red lipstick turned out to be cocktail party goals. Fashion designer, Shehlaa Khan had not one but three showstoppers; Bhumi Pednekar's garment was a black lehenga, Isabelle Kaif had a beige one while Karan Johar rocked a window pane tweed oversized blazer. Lisa Haydon looked ethereal in an embellished lehenga for fashion designer Shreya Som. With her effortless walk Lisa owned the runway like nobody could imagine. Like he does the best, Ranveer Singh brought the fun quotient to the week as he rocked the runway of high street brand I Love Gen.
Decked up in a gold outfit, Aditi Rao Hydari stole all hearts as she closed the fashion show for designer Sailesh Singhania. Karisma Kapoor's showstopper look spelt easy and summer. She rocked the runway in a light printed anarkali for Punit Balana. Diana Penty mesmerised everyone as she sashayed down the runway for label Mishru. Kangana Ranaut stunned in an elaborate choli and embroidered lehenga on designer Anushree Reddy's runway. Anil Kapoor and Janhvi Kapoor rounded up the day 4 of LFW 2019 with Raghavendra Rathore's designs. Malaika Arora, Daisy Shah and Sania Nehwal turned perfect showstoppers for couturier Manoj Agarrwal. Siddharth Roy Kapoor looked dapper in a jet black jacket as he rocked the runway of designer Kunal Rawal at the fashion week.